Now that summer is almost over, the long dry days and warm nights will give way to cool crisp mornings and as autumn approaches . . . The Plant Sale. With luck this winter will bring hopes of copious amounts of rain as predicted by the National Weather Service. El Niño weather patterns are perfect for adding plants to the garden. Suzette and I think this will be a very good thing for the plant sale. More than ever we can say, “use the winter rains to help establish your native plants.” November is one of the best months to plant in. This is why the sale has always been held in the fall. So please keep this in mind while talking with your friends and neighbors about the sale. As always, the plant sale is our biggest fundraiser for the year. The money we earn goes towards meeting room rental, web page maintenance and upgrades, and the Obispoensis newsletter printing and mailing. Suzette and I invite any and all members, new or old, to please volunteer to help at this year’s annual plant sale. There are many jobs to be done and I can always match you to something that fits best for you. Some jobs are: setting up chairs and tables, unloading plants, directing traffic, assisting with plant sales, and answering plant related questions. It’s a great way to meet new people, talk to old friends, learn plant names, and get some exercise. We will have books, posters, T-shirts, … oh did I forget to say volunteers get first pick of plants before the sale starts. Call 805-674-2034 to volunteer or ask questions. Just indicate hours that you can help. I represent Wild Jules. We make CA native wildflower and grass seed balls by individual variety. If you are not familiar with seed balls, the seed is proportionately mixed with red clay and compost to provide a self-contained method of growing native varieties. The clay protects the seed from birds. The seed cannot blow away in the wind. Germination is triggered by temperature and precipitation. The seed, safely rolled within the balls will wait patiently until their individual requirements are present. Seed balls are a terrific tool where unpredictable rainfall, thin or compacted soils and rough terrain inhibit more conventional methods of cultivation. 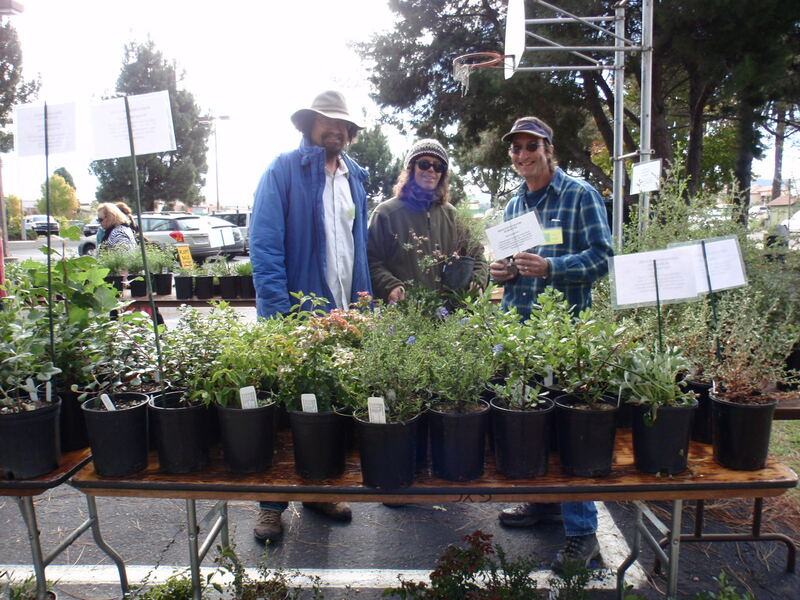 A question for you – would The SLO Chapter consider allowing us to sell seed balls at your fall plant sale with part of the proceeds going directly to your chapter? We have participated in the Santa Clara, El Dorado and SacValley Chapter’s plant sales with good results. Any consideration you may give to this request would be greatly appreciated!